MCA Suite is a platform for funders and brokers to manage merchant cash advance relationships and track deals from lead to collection stages. Users of MCA Suite need to first understand the following concepts; once that happens, MCA Suite will become a very powerful tool to help brokers and funders alike. 1. Treat MCA Suite as a specialized address book. MCA Suite is designed to help you manage all of your MCA relationships. Between brokers, merchants, funders, investors and the myriad other entities involved in an MCA deal, a complex network begins to develop. MCA Suite helps you manage all of those moving parts by treating both people and companies as contacts and using them as building blocks to tie relationships together. 2. There are two kinds of Contacts – a Company and a Person. A “Company” contact can be any merchant, broker, funder, collector, or credit card processor in your network. 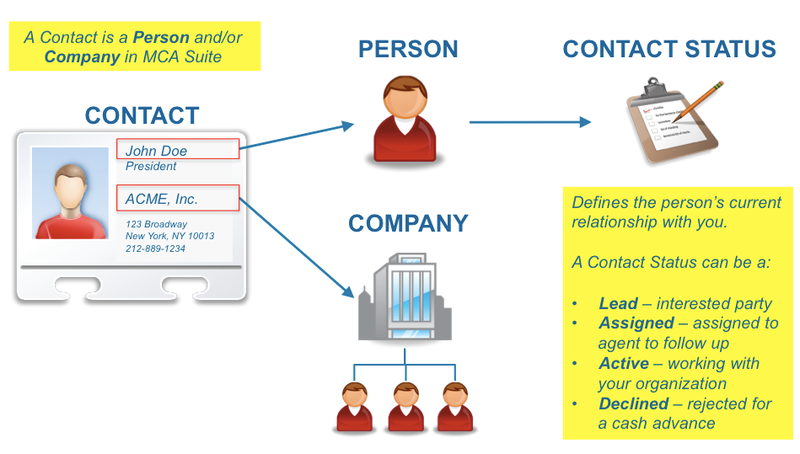 A “Person” contact is any individual who serves as a point-of-contact for those companies (e.g., a merchant owner, a broker within a brokerage, etc.) or a single, individual contact unaffiliated with any company. 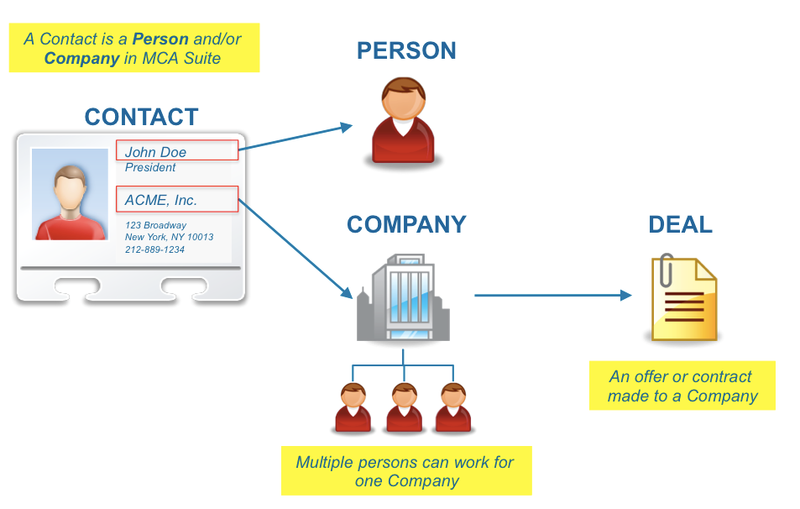 When a Contact is created, MCA Suite may create two records in the database - a Person (when there is a first and last name) and a Company (when there is a Company and/or DBA). Here's a related article with more information on: "What is a Contact?" a. Broker – A company or individual that connects merchants with funders. 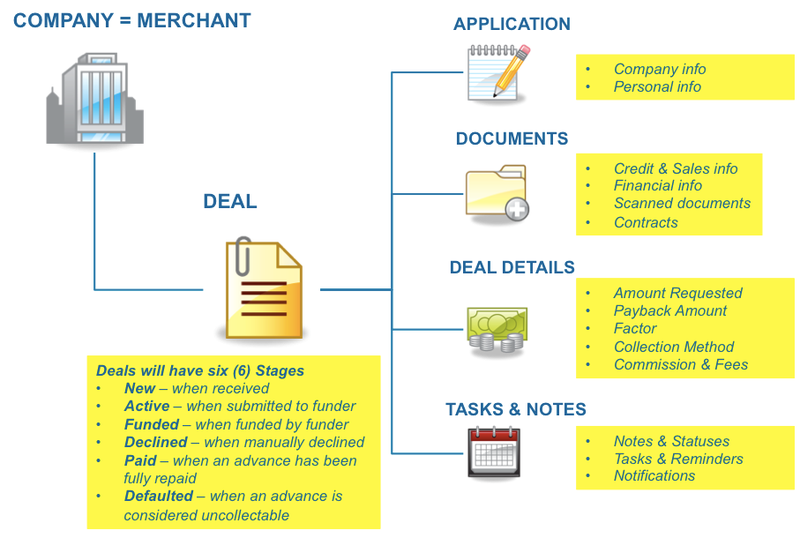 b. Collector – A company or individual that helps funders collect future receivables from merchants. c. Funder – A company or individual with cash to buy future receivables from merchants. d. Investor – A company or individual investing in cash advance deals independently or with the funder. e. Merchant – A company or individual that will take a lump cash sum in exchange for future receivables. Contact types are required for all contacts entered into MCA Suite. A contact can have multiple contact types, i.e., funder and investor. Using these five key contact types, MCA Suite can help funders and brokers manage all of their relationships. Here's a related article with more information on: "What are Contact Types?" 3. Each Contact Person can have one of these four statuses associated with a person. Everyone - the most global access setting. This means that every system user in your instance of MCA Suite will have access to the page(s) set to this permission level. User+ - the most restrictive access setting. This means the user who created the page will have automatic access to it. That user or any admins can then decide to grant ADDITIONAL users access. Simply select names of the agents to whom you would like grant access permission from the dropdown list of system users. Team - if you have teams created in your MCA Suite instance, you can set access permission on a team (i.e., group of users) level basis for each record (company, person or deal). For more information about Teams, please see the support article, "How Do I Set Up Teams?" Note: Administrators will have access to all pages in MCA Suite at all times. Access Permission settings will not bear any effect on Admin access. Access Permission Logic. When you create a Contact (i.e., John Doe at ACME, Inc.), the Person and Company will have the same Access Permission upon creation. You can set the Company (ACME, Inc.) or the Person (John Doe) to a more restricted access such as "User+" If a restricted access permission is set to "User+" and no additional users are added to the permission list, the Contact (Company or Person) will not appear on search results by any system users except for Administrators and the page creator. Deal level security is dependent on Company level security. In order for non-admins (i.e., agents) to have access to a Deal created for a Company (Contact), those users MUST first have access to the Company record. A user will not know the Deal exists in MCA Suite if s/he does not have access permission to view the Company details first. In that sense, Deal access permission is nested within Company access permission. 5. A Deal is associated with a Company. Deals are typically merchant cash advance deals. Funders and brokers offer deals to companies and not to individuals. A deal contains offer details, collection methods, documents, commission schedules and other information required to take the deal from the underwriting stage to final funding. 6. Each Deal has a stage and a status. A Deal stage is a system generated status that cannot be changed by MCA Suite users. 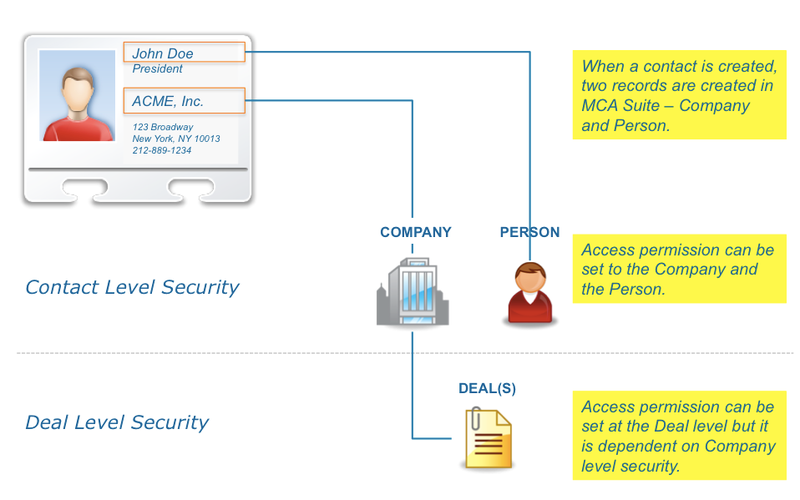 MCA Suite users can define individual statuses associated with the Deal. An administrator can also choose to hide Deal Stages. Active – A Deal automatically becomes “Active” when two or more deal notes are added to the Deal. For brokers, a deal is active when submissions exist. The following stages are only available for clients who have paid for the submissions module, primarily our broker customers. Submitted – Brokers only. When a submission has been created to at least one funder, the deal stage will become "Submitted". 7. An MCA Application is an application a funder or broker sends to a merchant to apply for a cash advance. 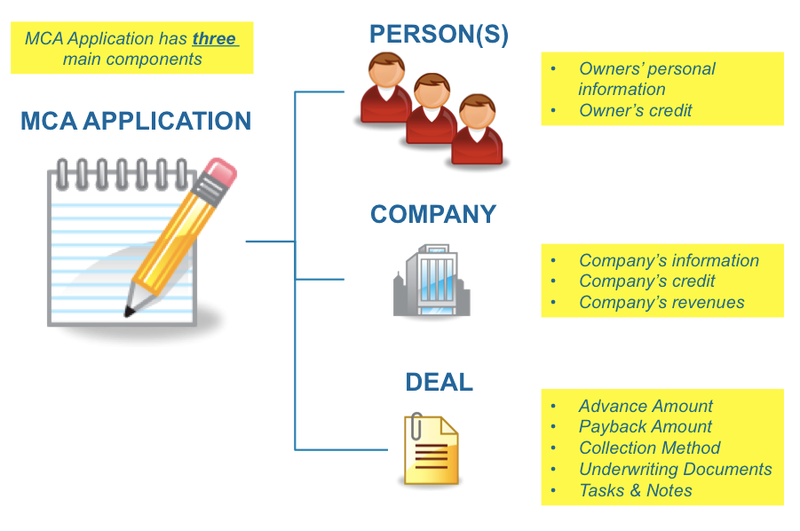 The MCA Application contains three main elements: company information, contact/owner information and deal details. When an MCA Application is created, MCA Suite automatically creates and builds the relationship between those three elements. 8. A Submission is a deal sent to an outside funder to review and make an offer on. 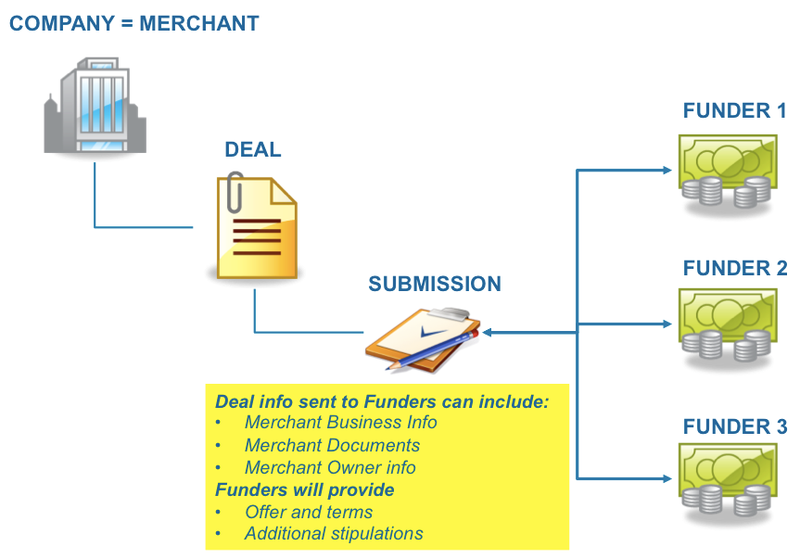 A submission includes essential information like merchant business info, merchant owner credit info, initial amount requested, supporting documents and any additional stipulations required by the funder. All of the files uploaded to the Documents section of a deal (which contains underwriting details and also serves as a document repository for the deal) can be attached to the submission sent to the funder.